Enhance your home with the cozy character of this two-toned dining table. 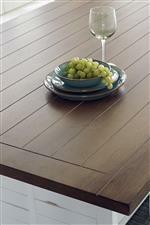 Its distressed finish gives the table texture while its clean lines are still easy on the eye. Its open base also prevents this table from looking too big and bulky, keeping the atmosphere light and welcoming for you and your guests. The Shutters Transitional Rectangular Dining Table with Two-Toned Finish by Progressive Furniture at AHFA in the area. Product availability may vary. Contact us for the most current availability on this product. The Shutters collection is a great option if you are looking for Transitional Cottage Coastal furniture in the area.